Posted January 25, 2016 by oceanoracle & filed under Seashells. Happy New Year – 2016 is here and that means we all have an excellent opportunity to change the trajectory of our lives, a chance to get off the paths we were all on in 2015. If you were feeling unaccomplished, that your soul was not having any opportunity to soar, then this is your time to shine. While New Year’s resolutions seem as cliché as whatever a motivational speaker might spout off at you in the freemason hall of some hotel, there is an absolute validity to their importance. Resolutions provide us with structure – now whether that structure falls apart or not, it is still a structure giving us some steady ground as we push forward into our new lives. In a way, resolutions are like seashells – not only do they provide us with a solid foundation, they also point us in the right direction, which I have explored in the last few blog posts leading up to the New Year. Seashells give us a glimpse into the possibilities of the good life or at the very least the right kind of life. 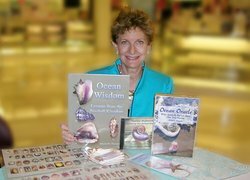 After all, “Working with seashell partners can facilitate positive change in your life. As the shells reveal hidden thoughts and beliefs that may no longer serve you, this empowering awareness can reshape your future.” Seashells also remind us that the final curtain will fall on the bigger picture. This might be why Southern seashell graves, mounds with seashells cemented on them to create protective grave covers, were so popular a century ago in Texas, Alabama, Georgia, Mississippi, Louisiana, and Florida. The picture of St James is from Kingdom of the Seashell originally copyrighted 1972 by R. Tucker Abbott. 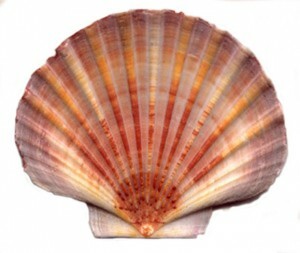 In particular, the St. James scallop is found on the shores near Compestella, Spain. 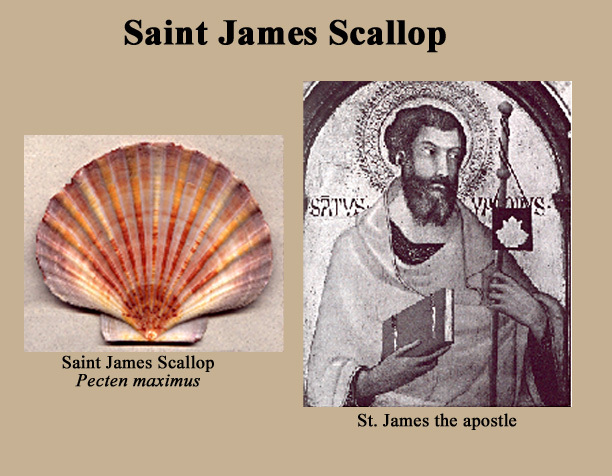 Sacred pilgrimages are made here to the shrine of St James the apostle. As the pilgrims were cleansed of their sins, they picked up St. James scallops from the shore and placed them in their hat brims to symbolize their new status. 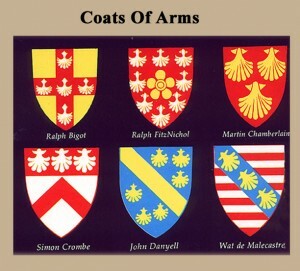 The coats of arms is from SHELLS Treasures from the Sea copyrighted 1979 by James A. Cox. Later in British heraldry, family coats of arms included stylized scallops associated with their heroic ancestor who fought in the holy wars, or made the pilgrimage to Compestella. In this way, the scallop combines the qualities of a sacred journey and being someone’s hero to yield a hero’s journey. It is also the symbol of Shell gasoline stations. With so many theories surrounding this interesting tradition, you will surely not be bored digging into it, but one thing remains clear: Seashells played a prominent role in representing the transition from this life to the next.